Trade at low commission rates and benefit from a suite of features designed to meet your trading needs. Seize opportunities in the U.S., Singapore and Hong Kong markets with Citibank Brokerage. * For USD Cash Trading Account, the minimum balance to earn interest is USD 5,000. For SGD Cash Trading Account, the minimum balance to earn interest is SGD 1. For HKD Cash Trading Account, the account is not interest bearing. Please note that interest rates are subject to the bank's periodic review and may change without prior notice. 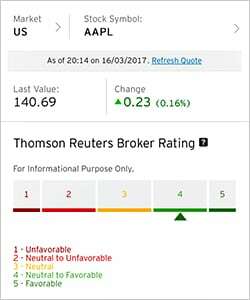 The Thomson Reuters (TR) Stock Analytics is an analytics tool which provides a series of stock market insights and analysis to assist your investment decisions. 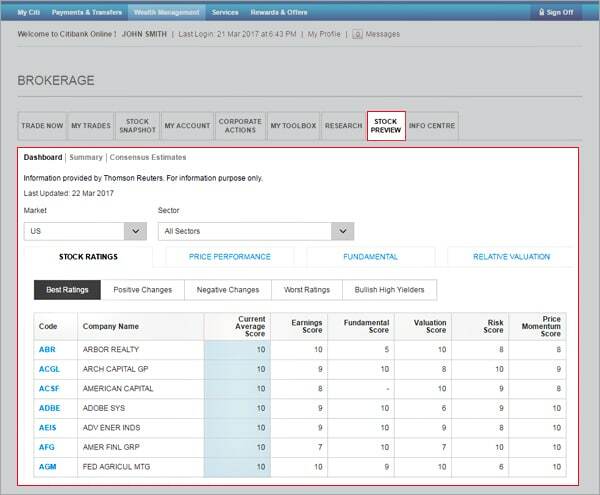 Get the most updated stock ratings and target price proposed by TR professional analysts in our cutting-edge brokerage platform. Trade now to enjoy our US market brokerage commission at 0.3%, with a minimum charge of USD25. Please complete our brokerage account opening from below and submit in person at any of our Branches. Click here to submit your particulars and we will be in touch with you. Call our CitiPhone Hotline at (65) 6225 5225 to find out more or request for a set of the application forms to be mailed to you. Login to Citibank Online with your Single User ID and password. 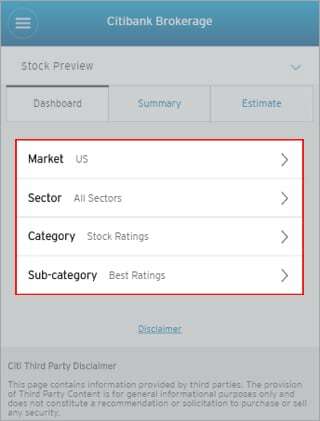 Scroll over investments and select Citibank Brokerage. Key in your One-Time PIN (OTP) when prompted. 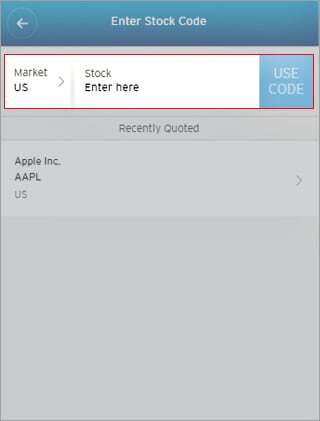 Login to Citi Mobile with your Single User ID and password and start trading on the go. Key in your One-Time Pin (OTP). 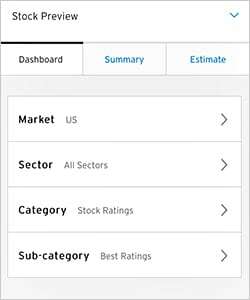 Click on the "Citibank Brokerage" icon and select "Trade Now" to begin trading. For general brokerage enquiries, call our CitiPhone Hotline at (65) 6225 5225. With effect from 1 April 2019, all Brokerage customers will need to have a valid Investment Risk Profile ("IRP") and the required Knowledge and/or Experience in 'Equity' and/or 'Exchange Traded Fund ("ETF")' to trade in stocks and/or ETFs. Please click here to update your IRP online. This service is available from Mondays to Fridays, 8.30am to 5.00am. Call our Brokerage Officers to trade securities listed on U.S., Singapore and Hong Kong markets.For general brokerage enquiries, call our CitiPhone Hotline at (65) 6225 5225. What is Citibank Brokerage Hotline? Our Citibank Brokerage Hotline service provides you with a complementary channel to trade in addition to Citibank Online. You can call our Brokerage Officers at 6333 3223 to place phone orders for U.S., Hong Kong and Singapore markets. The commission charges are applicable for phone orders. Full details of our fees and charges can be seen in our Charges tab. Citibank Brokerage Hotline service is available Mondays to Fridays, from 8.30am to 5.00am. Note: Phone orders confirmed and executed cannot be modified or cancelled. Only good for the day orders are accepted for phone orders. Account(s) can only be opened for Singapore citizens, Singapore permanent residents, or employment pass holders, who are aged 21 years and above. Applicant should not be an undischarged bankrupt nor have any delinquent records with any stock broking houses in Singapore. We are not able to accept applications for Corporate, Power-of-Attorney and "In-Trust-For" accounts. Can I open an account and trade through Citibank Brokerage if I am a U.S. Resident / Citizen? Citibank Brokerage services are not available to U.S. persons. To apply for an account to trade in a new market, please contact our CitiPhone Hotline at (65) 6225 5225 for assistance. Where can I obtain a copy of the W-8Ben form? You can download the W-8Ben form or call CitiPhone Hotline at (65) 6225 5225. For your convenience, you can to download the business reply envelope to mail the W-8Ben form to us. Do I need to submit new W-8Ben Form for my new account? No, you only need to submit once. If the new account has a joint holder, he/she will need to submit a W-8Ben Form. If you are an existing banking customer, your new brokerage account will be linked to your existing ATM card and PIN. If you would like to apply for a new PIN. If you are a new customer, an ATM card and PIN will be sent to you by post in separate mailers. If I decide to close my account without having made any transactions, will I get all my money back? Yes. You will receive your remaining cash balances. However, if you close your account within the first 6 months, an administration fee of SGD50 is applicable. For USD Cash Trading Account, custodian fees will also be applicable. Yes. For USD Cash Trading Account, the minimum balance to earn interest is USD 5,000. For SGD Cash Trading Account, the minimum balance to earn interest is SGD 1. For HKD Cash Trading Account, the account is not interest bearing. Note: An ATM card for cash withdrawal will be issued upon successful account opening. Receivables are sales proceeds from your successfully executed "Sell" orders. You can use receivables to fund your "Buy" orders. Receivables can be used to fund "Buy" orders from "Sell" order successfully executed on Trade day (T) and the next 2 working days (T+2). The Receivables amount will be credited into your Cash Trading Account after 9.00pm, Singapore Time, on the second day (T+2). Full details of our fees and charges can be seen in our Charges tab. Custodian fees apply to the stockholdings in your account(s). It is charged semi-annually on 30 June for the period of January to June, and 31 December for the period of July to December. The fees apply at a rate of 0.01% of your monthly average stockholding balance, up to a maximum of USD 100 for U.S. market stockholding and/or HKD 600 for Hong Kong market stockholdings, for each account. The fees apply at a rate of 0.02% of your monthly average stockholding balance, up to a maximum of SGD 100 for SG market stockholding, for each account. Custodian fees charged at the end of the 6 months is USD 19. Am I subject to any U.S. Tax? This only applies to U.S. Brokerage Account holders. All brokerage accounts are held under the US tax bracket of 30% withholding, which is imposed by the US tax regulator - IRS. The tax will be imposed on dividend payments and the custodian will perform the withholding automatically. This means, dividend payments are always net of tax when credited to your brokerage account with Citibank. 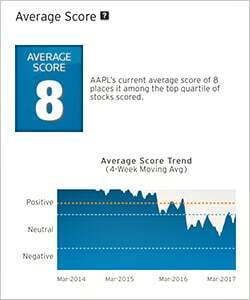 Customers do not need to perform any tax reporting on U.S. shares. This only applies to U.S. 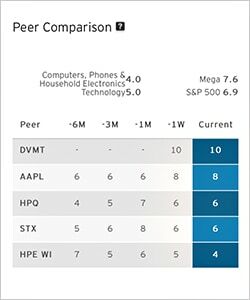 Brokerage Account Holders. It refers to Securities And Exchange Commission (SEC). The federal agency created by the Securities Exchange Act of 1934 to administer that act and the Securities Act of 1933. The statues administered by the SEC are designed to promote full public disclosure and protect the investing public against fraudulent and manipulative practices in the securities markets. Generally, most issues of securities offered interstate commerce or through the mails must be registered with the SEC. (See Maloney Act, Securities Act Amendments of 1975, Securities Exchange Act of 1934). For more information, the official website is www.sec.gov. Are there any risk profile or knowledge and/or experience requirements that I need to fulfil before I can place an order with Citibank Brokerage? 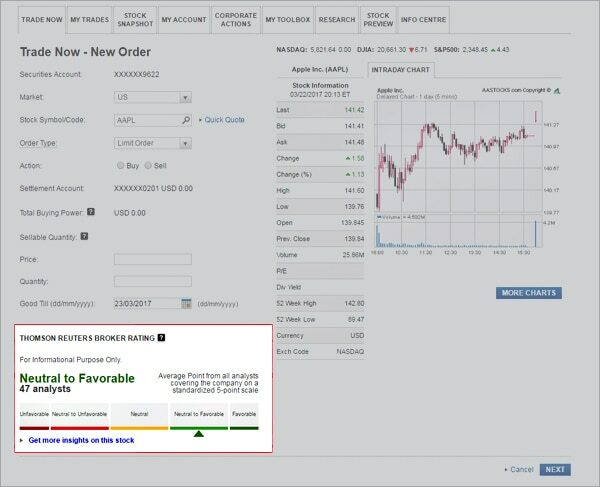 What are the prohibited trading practices that I must be aware of when trading through Citibank Brokerage? The Securities and Futures Act, Chapter 289 of Singapore (the "SFA") makes it an offence to engage in certain prohibited conduct in relation to securities. The prohibited conduct extends to acts within or outside Singapore, as well as acts in relation to securities listed in Singapore or elsewhere. You must familiarise yourself with the relevant provisions of the SFA (as amended from time to time) and ensure that you do not engage in such prohibited conduct when trading through Citibank Brokerage. insider trading7: (i) insider trading refers to dealing in securities or procuring another person to deal in securities whilst in possession of non-public, price-sensitive information; (ii) the communication of non-pubic, price-sensitive information to another person is also prohibited if the person communicating the information knows, or ought reasonably to know, that the recipient of the information is likely to deal in securities or procure another person to deal in securities. Engaging in such prohibited conduct may result in you being convicted of a criminal offence, being subject to a civil penalty or being subject to civil liability. The above does not constitute legal advice. If in doubt, you must consult your own independent legal adviser. The SFA can be found online on the Singapore Attorney-General’s Chambers’ website at http://statutes.agc.gov.sg/. With effect from 1 August 2011, trading sessions are held daily from Mondays to Fridays between 9.00am to 5.00pm. * Daylight Savings Time begins on the second Sunday in March and end on the first Sunday in November. Please note that only DTC eligible US securities will be offered for trading. From 19 January 2015, SGX introduces reduced board lot size. Most counters listed on SGX will be trading at 100 shares. For more information on the list of counters, please refer to SGX.com. Yes, the table below shows the bid size and price range of SGX (with effect from 4 July 2011). Effective 3 October 2016, the U.S. Securities and Exchange Commission ("SEC") has launched a tick size pilot test where small-cap equities will be traded in $0.05 increments. 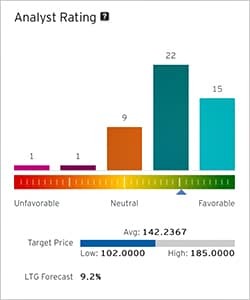 Please refer to the following website for the list of selected securities: http://www.finra.org/industry/tick-size-pilot-program-implementation-plan. Do note that orders that do not meet the above criteria will be rejected. 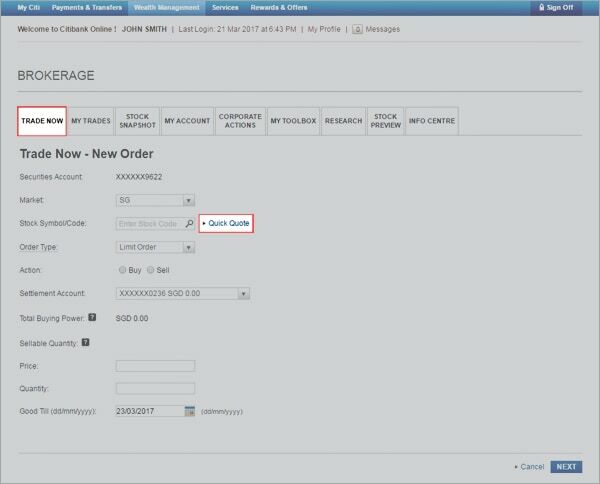 You may modify or cancel orders that have not been executed. 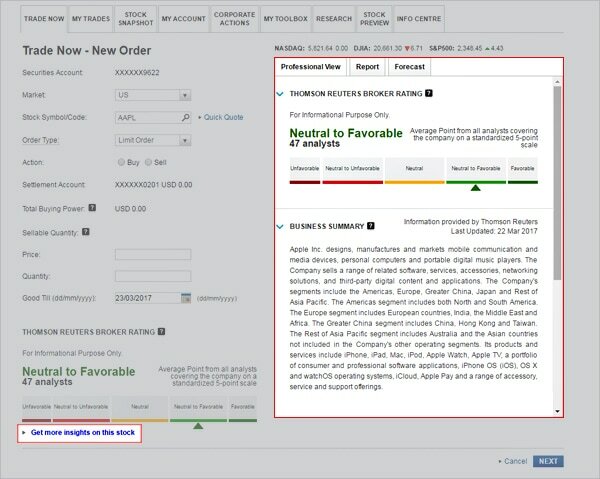 These are displayed under the Trade Status, Open orders screen. You may also call our Citibank Brokerage Hotline 6333 3223 for assistance on the navigation to modify/cancel your order online. For Singapore and Hong Kong market orders, you can only modify new quantity to a lower value. No modification is allowed from a lower quantity to a higher value. To increase quantity, please submit a new order. For U.S. market orders, you may modify your quantity to a higher new quantity or lower value. You may modify your price to a new higher price or lower value for all markets. Will I be able to "Amalgamate" my trades? No. You need to transfer the securities you are holding with other security firms to Citibank Brokerage to be able to trade those securities through Citibank Brokerage. Please refer to Securities Transfers for more details on transferring. If the counter you would like trade is not reflected on screen, please call our Citibank Brokerage Hotline at 6333 3223 for assistance. What are the procedures to transfer securities held with other securities firm to Citibank Brokerage? Provide us with an instruction and details of your existing brokerage firm / depository agent by completing the Security Transfer Form. If you have further queries, please contact our CitiPhone Hotline at (65) 6225 5225. How long does it take to transfer shares from another brokerage firm over to Citibank? If I decided to close my Citibank Brokerage account, how do I transfer my security holdings out? Initiate the transfer process by providing us with an instruction and the details of your other brokerage firm / depository agent by completing the Security Transfer Form. To facilitate the transfer, please provide Citibank Brokerage Custodian details (as stated above) to your other brokerage firm / depository agent. The Cash Trading Account(s) and Cash Security Account will only be closed when the securities have been transferred out of Citibank Brokerage. How do I transfer Singapore shares from my CDP account to my Citibank brokerage account? Complete both the Security Transfer Form and CDP 4.2 form. Submit both forms to Citibank. Buy Orders: Funds required for the purchase will be earmarked on trade date and debited from the Cash Trading Account on T+2 by midnight (Singapore Time). May I use my CPF for the payment of my shares, or trade shares that are deposited in my CPF Investment Scheme account (CPFIS)? Mandatory events - Citibank does not send any general notification to account holders for Mandatory events. Voluntary events - It is the customer's responsibility to check with an external party, such as company websites or news releases, for any corporate action announcements. As a courtesy, Citibank may review the terms of the offer and will on a best-efforts basis send eligible shareholders an eMail informing them of the corporate action. Customers may submit their election directly through Citibank Online, Mobile App or their Relationship Managers. Will I be notified if the security I hold has dividend payouts? Yes, you will receive a letter from Citibank. Once the payout is settled, it will be credited into your Cash Trading Account. The payout will also be indicated on your monthly statement. Will I be notified if the security I hold has bonus, share split or other corporate action? Yes, you will receive a letter from Citibank with regards to the corporate action of the securities that you hold. The letter will be sent after the adjustments have been made. The adjustments will also be indicated on your monthly statement. Please note that "Sell" orders of the respective securities can only be placed after the adjustments have been settled and reflected on your Cash Securities Account. The crediting of the corporate action entitlements are subject to receipt of confirmation of our custodian. The timing may vary depending on the nature of the corporate action and may be after the effective date of the corporate action. For assistance, please call our Citibank Brokerage Hotline at 6333 3223. Custodian fees apply at a rate of 0.01% of your monthly average stockholding balance, up to a maximum of USD 100 every six months. *Prevailing GST applies to the U.S. market brokerage fees. Effective 1 June 2014, there is a clearing fee of 0.0325% charged by SGX on the trade value. There is a SGX Trading Access Fee of 0.0075% charged by SGX on the trade value. Prevailing GST applies to the brokerage rates, CDP Clearing Fee and SGX Trading Access Fee. Prevailing GST applies to the Hong Kong market brokerage fees. Stamp Duty of 0.10% of contract value applies for change in beneficial owner transfers. The above examples and screenshots including references to specific securities are hypothetical and provided for illustrative purpose only. It does not represent all possible outcomes or describe all possible factors that may affect the payout of a transaction in Citibank Brokerage. The products and services mentioned above are not offered to individuals resident in the European Union, European Economic Area, Switzerland, Guernsey and Jersey. This website is not, and should not be construed as, an offer, invitation or solicitation to buy or sell any of the products and services mentioned herein to such individuals. 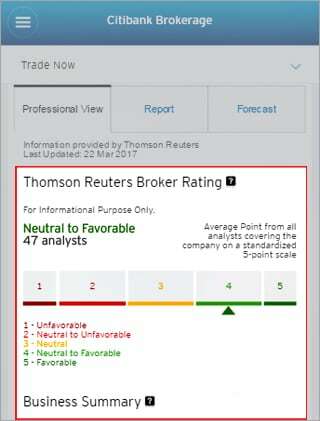 Thomson Reuters full disclaimers, terms and conditions apply.